Feel more awake. For the relief of temporary tiredness. 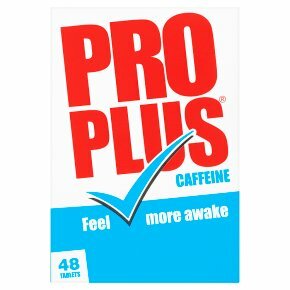 Pro Plus contains caffeine, a stimulant that can help to maintain mental alertness and make you feel less tired. For adults and children over 16 years: 1 to 2 tablets with or without water, as required during the day. Do not exceed 2 tablets in 3 hours, or 8 tablets per day. Unsuitable for children under 16. If tiredness persists consult your doctor. Read enclosed leaflet before use.